Budget airline Ryanair has said a ruling that it received illegal incentives to use a small Belgian airport is a "disaster". The Irish airline was given discounts on landing fees and other perks to use Charleroi airport, south of Brussels. The European Commission has now said that amounted to an illegal subsidy from the Walloon authorities. The Commission said Ryanair would have to repay a "reasonable" sum, which it implied would be about 4m euros. But Michael O'Leary, chief executive of Ryanair, said: "We consider this decision to be a disaster for consumers, and for low-cost air fares all over Europe. "And it is a disaster for publicly-owned airports which can no longer compete with [private] airports all over Europe." He said the decision interfered with the free market, and that the subsidies were "not illegal". EU transport commissioner Loyola de Palacio had earlier said: "This decision means that we are going to declare as incompatible a large part of the elements of the arrangement between Ryanair and Charleroi." Some of the rebates for Ryanair were permissible as part of regional development support for the airport. But some of the subsidies will have to be returned, the Commission said, because it was "incompatible with the proper functioning of the internal market". She said the ruling would bring "greater transparency into contractual relations between airlines and airports, especially regional airports". Other budget carriers have downplayed the impact on them if the ruling is extended to all state-owned airports offering "sweeteners" to airlines. Ryanair is by far the most reliant on deals it has struck with regional authorities across Europe, although some other low-cost carriers have cut their own deals. An Easyjet spokesman said: "We welcome today's comments by the European Commission clarifying the relationship between airlines and publicly-owned airports. "While the terms of today's ruling refer specifically to Ryanair's arrangements with Charleroi Airport, it is supportive of the low-cost airline industry." They said Easyjet had a different business model to Ryanair, and welcomed the Commission's intention to use the ruling as a basis for uniform guidelines on airport landing charges and tariffs across the EU. "This will help clarify arrangements between airports and airlines - be they low cost, national flag carriers or charter." Exeter-based Flybe, which like Ryanair flies to a number of small, state-owned French airports, said its own deals with airports appeared unaffected by Charleroi ruling. It said the Commission's recognition of the need for discount deals on airport charges was "a huge win" for passengers. Meanwhile, Belgium's Wallonia regional government will examine the situation "without delay," according to economy minister Serge Kubla. "My recommendation will certainly be in the direction" of an appeal, he said. A final repayment figure has yet to be declared. But Ms de Palacio said the EU executive estimated Ryanair received 15m euros in subsidies for using Charleroi. She said 70-75% of the aid had been authorised, leaving Ryanair facing a repayment request of 25-30% of its subsidies. That would imply a sum of about 4.1m euros (£2.8m, $5.15m), well below the top-end figure of 7m euros some had initially feared. Ryanair shares rose 10% following the decision. Henk Potts of Barclays Stockbrokers said: "Other discount airlines do not have the same exposure to these secondary public airports as Ryanair does. "I think this will result in some of their expansion plans being put on hold. "Some profitable flights... may now become unprofitable ones, and prices on those may have to rise in the short term." Ms de Palacio said this might affect prices "by six or eight euros per ticket". The cut-price Irish carrier and the European Parliament had warned the ruling could force up prices, and that the Charleroi area, which has benefited from Ryanair's presence, could lose out if Ryanair now decides to cut operations from the region. Mr O'Leary said the airline would appeal to the EU's highest court, the European Court of Justice, and warned that an adverse judgement could force Ryanair to drop some routes out of Charleroi. 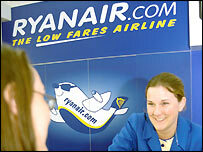 The presence of Ryanair is estimated to have boosted the run-down regional economy by about £30m a year. "We do not envisage pulling out of the airport altogether, but there may well be some reductions in flights and routes," he said. Ryanair had also earlier warned it could mean "the end of low fares and regional development in Europe". "One of Europe's most aggressive companies just had its wings clipped"